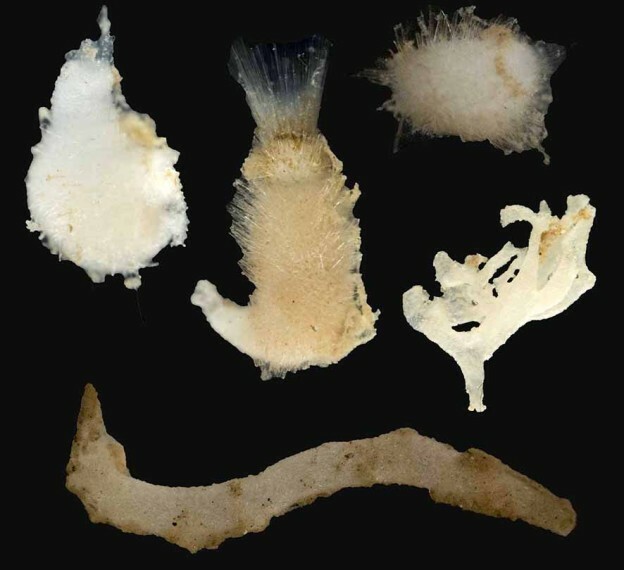 Fifteen species of calcareous sponges (phylym Porifera, class Calcarea) are known from the Disko Bay area, and nine of these have their type locality here, which means that this was the area they were fist described from. 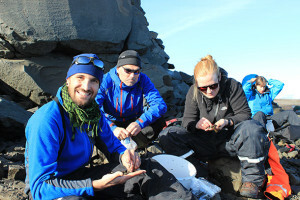 During this fieldtrip we wanted to collect calcareous sponges from Disko to get material that can be used for genetic studies to investigate the relationships between the populations in Disko Bay and populations of what is believed to be the same species in other localities. Largest calcareous sponge found during this fieldtrip. 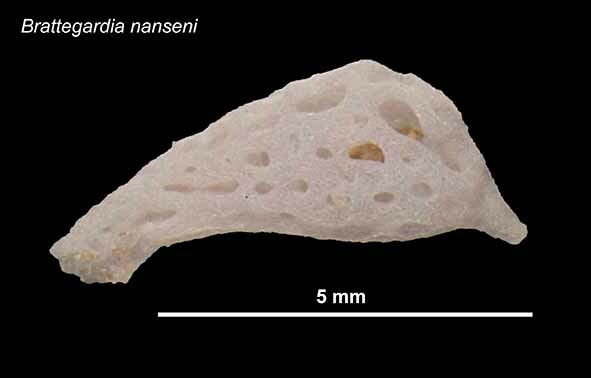 Identifying calcareous sponges is not a straightforward business; first of all they are very small (most < 1 cm), and secondly they do not have any obvious external characters like bright colours, legs or even a head. In stead they have spicules. 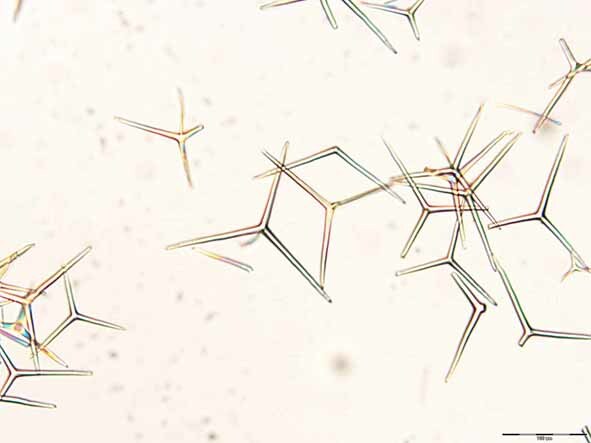 Spicules are small needle-like structures that function as the skeleton of the sponges, and in calcareous sponges they are made out of calcium carbonate. The shape of the spicules is an important character to identify sponges, in addition to the morphology of the sponge body and the arrangement of different types of cells. 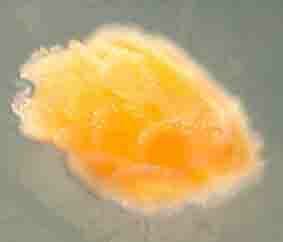 To look at the spicules of the sponges we need to clean the spicules from tissue and mount them on microscope slides. We cut out a piece of the sponge and add household bleach, which is left to work for 30 minutes, followed by three rounds of cleaning with distilled water, each taking 30 minutes. To make a permanent slide that we can look at again and again we use an imbedding medium that takes about 24 hours to dry sufficiently, so the time between we find a sponge specimen until we can identify it can be quite long. 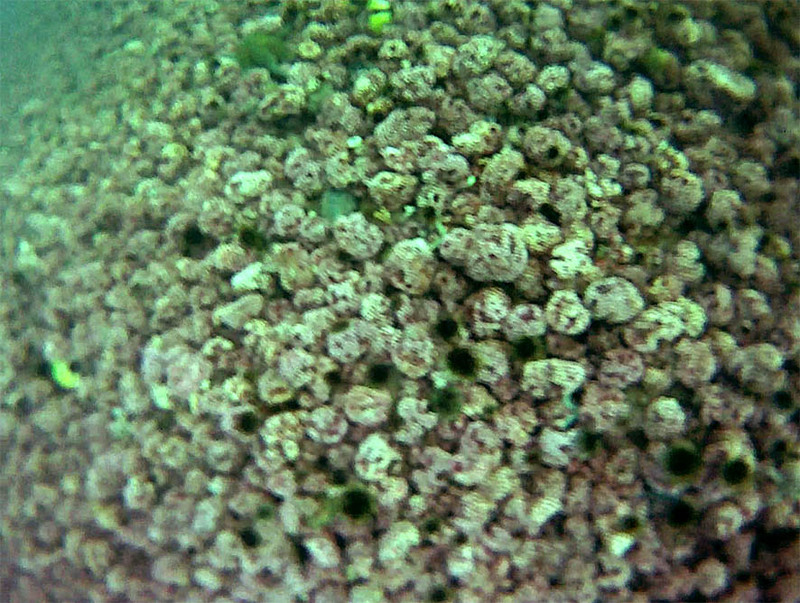 Collection of sponges fixated on ethanol. We have had quite good sampling success so far, with over 50 specimens of calcareous sponges, and a few sponges of other classes. 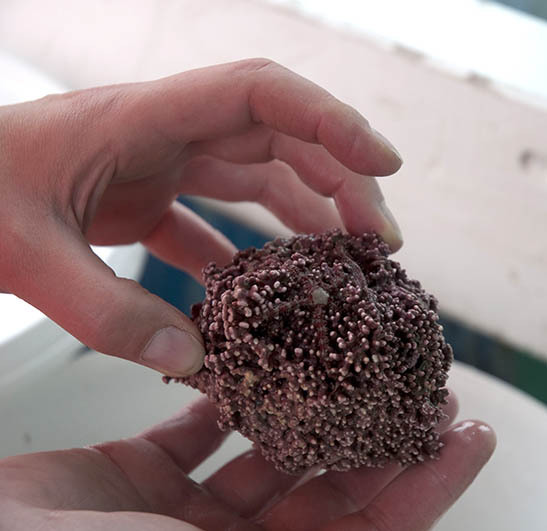 Most of the specimens were found sitting inside globular aggregations of Lithothamnion, a red algae (described in an earlier blogpost). Getting the sponges out from the Lithothamnion was tricky, both because they are very small and hard to spot, and because they were sitting quite far inside the globules, probably to get shelter. We also got many specimens from a triangular dredge sample that was sieved through a 1mm sieve. This is also where we found our largest specimen so far on this course! A beautiful Leucandra penicillata with a length of a whopping 5 cm! The calcareous sponges we have identified belong to at least eight different species, but the material has to be examined by experts to be certain of the identification. Not all the samples we collect are equally interesting, but ones in a blue moon something special comes along. Yesterday, while sorting through the material from the dredge, we realized that we had just found the remnants of our good friend Spongebob Squarepants! It was a sad day indeed as we sieved out our global mascot from the murky waters. 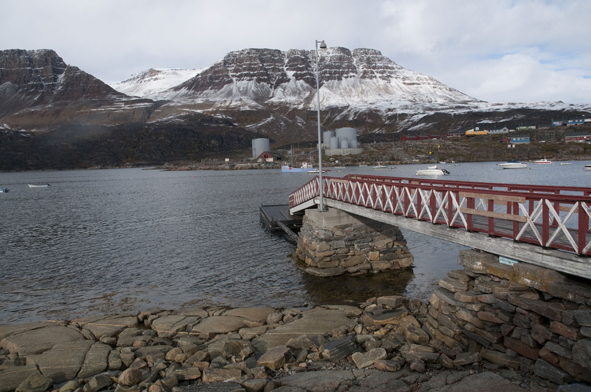 A memorial was thrown in his honour with the Greenlandic flag on half a pole. But life goes on and so does the search for new exciting sponges in different parts of the world! Oh no – Sponge Bob is dead!! By Henning and Mari (University of Bergen). This entry was posted in ForBio, ForBio Marine Course Greenland and tagged calcareous sponge, ForBio, Greenland on September 25, 2013 by cto042. First experiences with Arctic sea cucumbers. 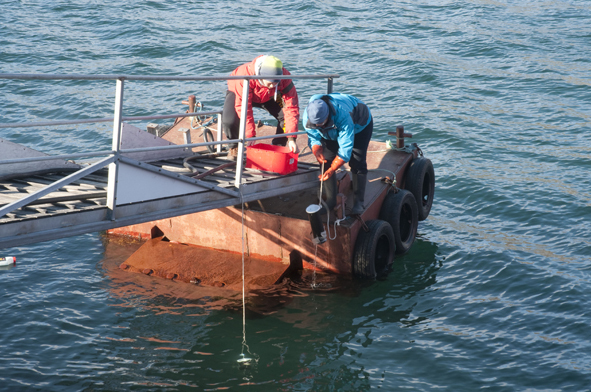 During the first day of our stay (13 Sep. 2013) at Qeqertarsuaq bay, Disko Island, we sampled using the triangular dredge at depth 37 meters. We got many specimens of animals and plants. 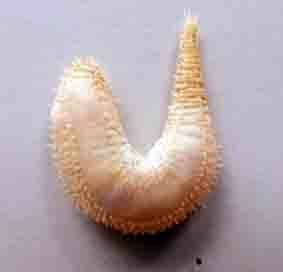 Anne Helene picked a sea cucumber from the sample container and called me to see it. It was stained with mud, but after quick cleaning it looks better. In the evening, I checked its outer characters and ossicles (small spicules in the skin) and identified it as a Pentamera calciger (Stimpson, 1851). It lives buried in the mud while its dendritic (branched) tentacles reach out above the mud surface for feeding. 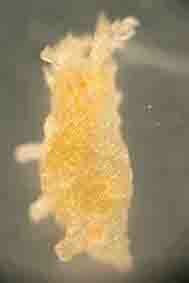 I got the second species of sea cucumber from the Amphipod Team as well (Anne Helene, Daniela and Henning). They found four specimens while looking for amphipods in algae. I was excited about those because they were Apodida (sea cucumbers without tube feet), the same group as I am working with in my PhD thesis. After examination, I found out that they are Chiridota laevis (Fabricius, 1780). One week later, Christiane and Inga gave me 6 sea cucumber juveniles from the large Lithothamnion aggregations, Kangerdluk, Disko Fjord. Of course! I never seen them before, they are so small (2-4 mm long) and have a nice orange colour. Under the microscope, they are a bit transparent and the ossicles are easy to see. I find that so amazing. I also asked Andreas to take these beautiful photos for our blog. Both belong to the dendrochirotid order. The species are Cucumaria frondosa (Gunnerus, 1767) and Psolus sp., respectively. Cucumaria can become close to 30 cm long when they grow up! Although I found only four species of sea cucumbers, for me, a student coming from a tropical country, this is a great experience and a good start to learn more about Arctic sea cucumbers. It is so cool! This entry was posted in ForBio, ForBio Marine Course Greenland and tagged Greenland, Holothuroidea, sea cucumber on September 24, 2013 by cto042. 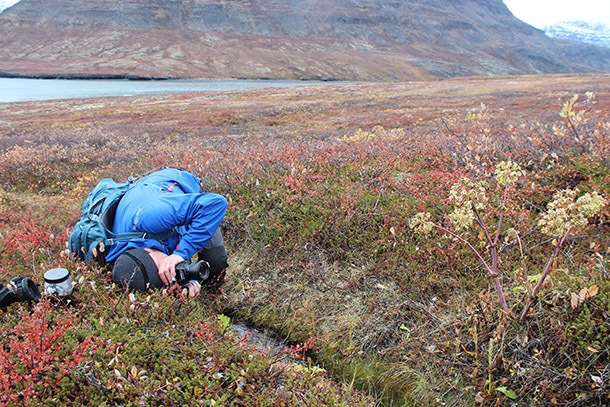 During our field-trip to Disko-fjord we took samples from an area densely covered with so-called Lithothamnion-aggregations (rodoliths) – a very special habitat (see also Mette and Jenny’s entry on our “Trip to Disko Fjord”) ! Mette taking a sample at the site. Christiane holding a gigantic Lithothamnion rodolith. 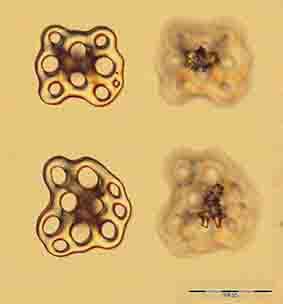 Lithothamnion species are calcareous red algae, that is, they have hard thalli due to calcium carbonate deposits. 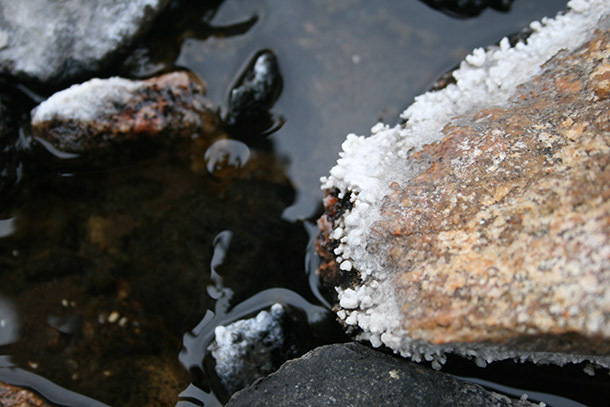 Most commonly they form a coating over hard substrates, but in Disko Fjord there is a species (Lithothamnion glaciale) that rather looks like a coral and forms so-called rodoliths. These aggregations grow to about fist sized “balls” that under stormy conditions may tumble on the muddy seafloor, much like tumble weed through old western movies, but usually they just lie there peacefully. As they are the only hard substrate in an otherwise very “soft” environment, they act as oases attracting a wide range of animals otherwise not found on mud. 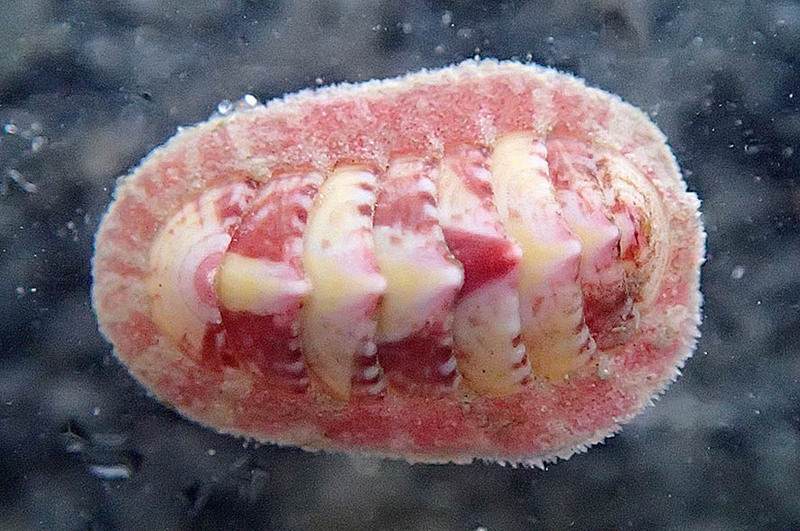 Also, the rodoliths appear to act as a nursery habitat for diverse species (we found baby chitons, baby sea cucumbers and various baby snails). Some of the animals are big enough to be seen by naked eye and are sitting on the algae. 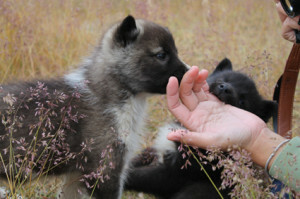 Other organisms are very small and need to be persuaded to let go and come out of their holes. So after picking all animals that we could see by eye, like some tiny sponges of not more than a centimetre, beautiful pink chitons, brittlestars, small sea urchins and sipunculid worms, we smashed all the algae and submerged them in magnesium chloride. That is a rather sneaky method to get to the tiny hiding creatures that still hold on and/or escaped our attention. Magnesium chloride acts as an anaesthetic and the animals let go of the substrate and can be washed off into a fine-meshed sieve and then be transferred into our petri dishes for further examination. 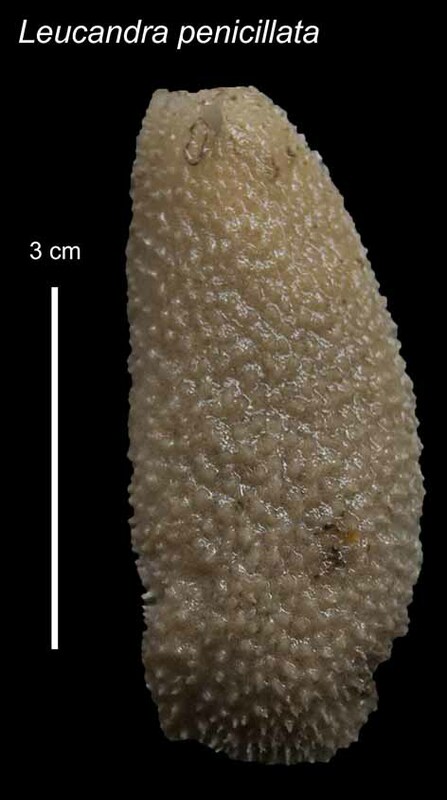 And this method revealed an even more stunning variety of animal life under 1 cm length: several possibly undescribed species of Acoela, microscopic worms that by some are thought to resemble the first bilaterian animals, but also different snails, flatworms, mites, polychaetes and crustaceans. 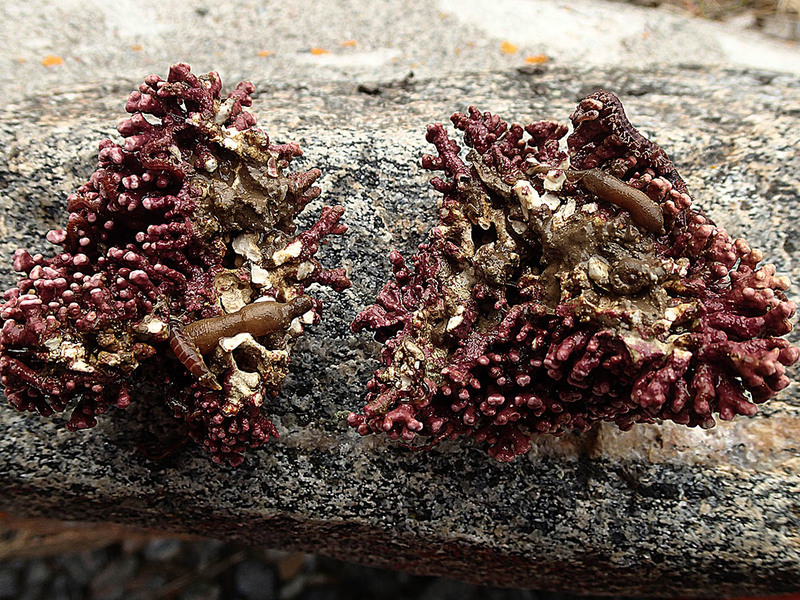 Also, Christiane found several individuals of a certain species of solenogasters (worm-shaped, shell-less, spiny mollusks) hitherto only known as the “Greenland neomeniomorph”. She desperately had been looking for some additional specimens to get an official taxonomic description completed. – Juhuuu! Rodoliths! – These beautiful algae turned out to hold an astounding variety of animal groups. 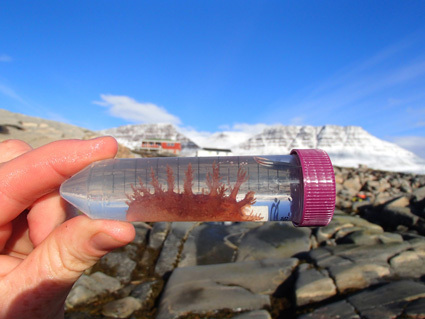 This entry was posted in ForBio, ForBio Marine Course Greenland and tagged Greenland, Lithothamnion, rodolith on September 24, 2013 by cto042. Finally!!!!!! Today was the day for the plankton folk to rule the Porsild, and boy did we rule! We set off at the crack of dawn (or around 8 am…). To our surprise breakfast was waiting for us, despite the early hour. Thanks to the troopers Anne Helene and Perpetua, who got up at 6.15 to prepare that for us! 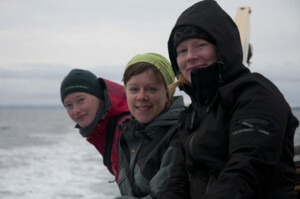 The group that headed out was Peter K., Sandra and Josefin, who were all on the hunt for plankton. But we also brought our super translator, Jakob, and Jeroen had the duty of assisting and entertaining. At first the weather was looking promising. The sun was shining and the water was calm, however as soon as we came out onto open water the waves got significantly bigger. The mighty captain of Porsild decided that conditions were too rough for our planned destination, and so instead he took us to an alternative spot. 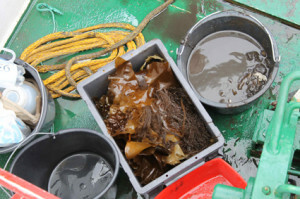 As Peter had some specific criteria for catching his beloved pteropods (planktonic snails), we needed to find a spot were the depth was a minimum of approximately 200 m. As some pteropods migrate down during daytime to avoid predators, the plankton net needed to go down to ca. 150 m.
As Josefin had only recently learnt that the water hose on board collected its water from 3 m depth, her surface phytoplankton samples were extremely easy to obtain!!! She could simply put her Barbie-sized phytoplankton net under the hose and filter out the plankton. Next up was Sandra. 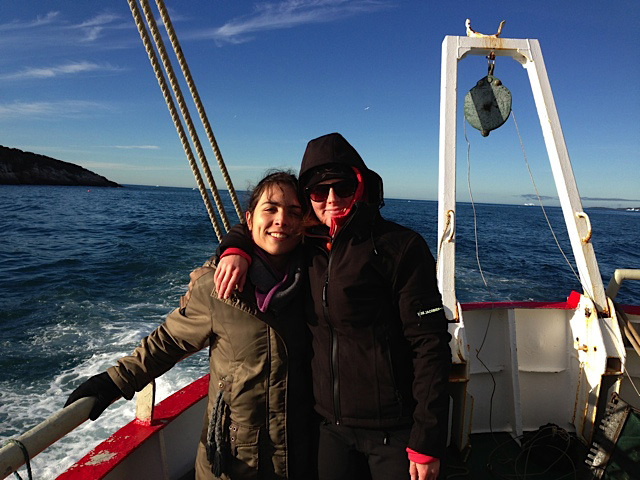 Sandra wanted to retrieve zooplankton samples from 25 m depth. Although our quick-mouthed and cheeky friend had been surprisingly quiet during the rough ride, it was now her time to shine. 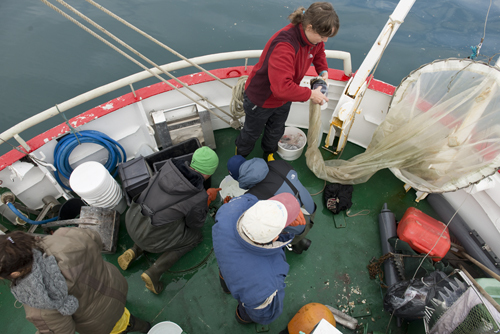 She quickly returned the zooplankton net into the water and gave strict instructions on the depth and length of the tow. As Josefin had buttered up the captain with pieces of chocolate, he was finally willing to follow the strict orders, marvellously translated by Jakob. In the end Sandra got the samples she needed without having any further problems. 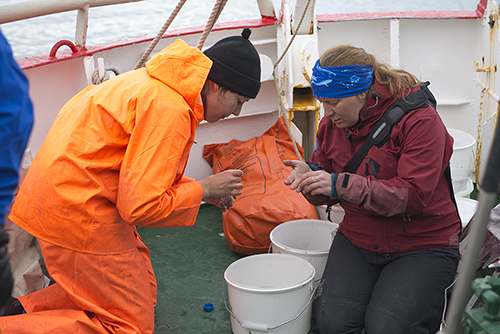 Last but not least, Josefin needed to collect phytoplankton samples from 40 m depth. 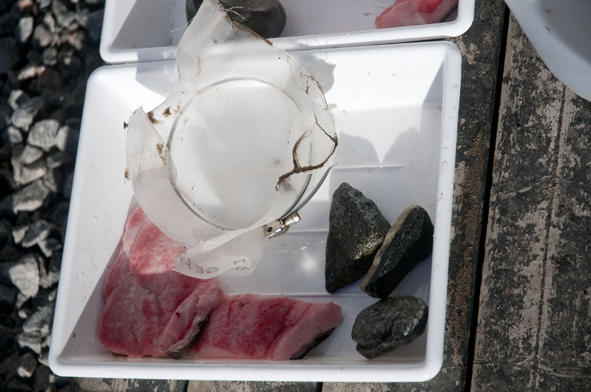 This was carried out with the help of diligent Søren and… a water sampler! The 60 litres of water that were collected, were then concentrated to a mere volume of 15 ml!! On our way back to the harbour winds and waves had picked up. Since Jakob had almost accidently dropped Peter’s samples back into the ocean, Peter was now guarding his buckets of planktonic treasures. He set up camp with a minimum of 1 m radius, which no man was allowed to pass. Unfortunately he had forgotten to bring lids, so for the last minutes of the cruise he had to hold the buckets in his hands to prevent the content from being spilled over the deck. After 3 hours we arrived back at the harbor without any further incidents. All in all, the trip was extremely successful. 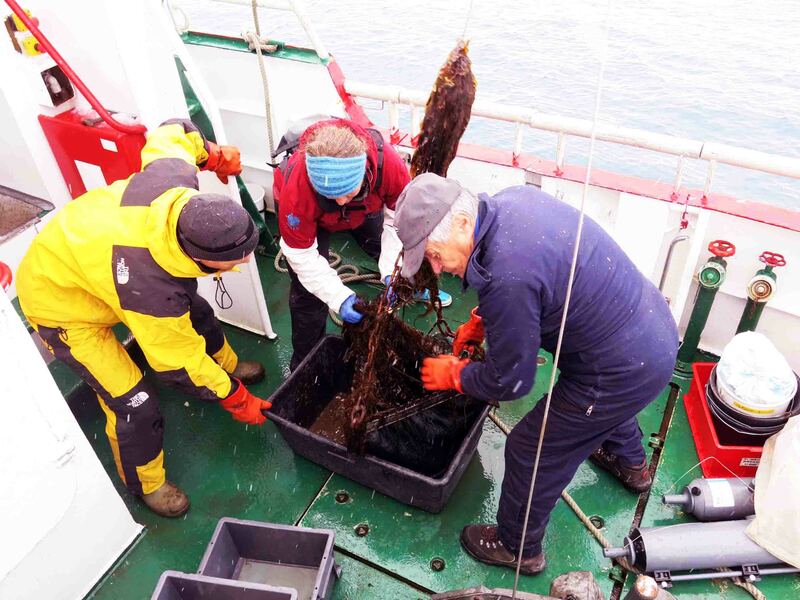 This entry was posted in ForBio, ForBio Marine Course Greenland and tagged Arctic Station, Disko, ForBio marine course, Greenland, Plankton on September 23, 2013 by cto042. Waking up bright and early Monday morning we all eagerly awaited a call from the captain of Porsild on whether we would be able to go on our sampling trip to Disko Fjord or once again have to change our plans due to bad weather. The call came and like a child on Christmas morning our eyes glistened with hope. The weather was even good enough to take the small speedboat with us, so three brave guys dressed up in teletubby-like survival suits, which are one size that really fits no one. We were told this little boat would be slightly faster than Porsild, and as we steamed out of the harbor doing approximately 5 knots it raced passed us at the speed of light with the mighty Johannes at the helm. On the Porsild we were all taken by the beautiful scenery, large icebergs and steep cliffs that plunged into the sea made almost every moment a Kodak one. 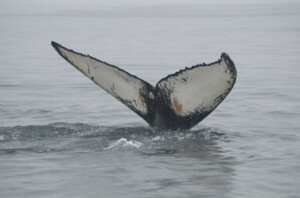 The sea was calm and not a single whale spotted so the trip was somehow uneventful in this matter. For our speedboat crew the story however was quite the opposite. Having arrived hours ahead of Porsild, our brave boys decided to do some fishing. This resulted in them catching not one, not two, but six large cods which we later prepared for dinner with the only spices at our disposal, salt and beer. They also had a taste of the Inuit everyday life when a curious seal approached the boat. Quicker than any gunman in the wildest of the west, Johannes reached for his rifle and that seal is now swimming happily in the eternal seas. 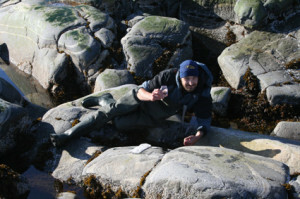 At the arrival of Porsild we all met up for some sampling of blue mussels. Oddly enough, the only one of us who actually works with this organism was still at the Arctic Station having us do his dirty-work for him. What a clever Dane he is, that Jakob. So, after replicating sampling grids and sorting and cleaning mussels until our fingers were the same temperature as the surrounding water we headed to a nearby village, population of 50. Half of us were to spend the night on Porsild and the other half were camping on land and therefore had packed both warm sleeping bags and thermal mattresses. The “campsite” turned out to be a house where government officials stay while visiting the area so needless to say, our campers was not particularly uncomfortable in their palace with a panorama view of the fjord and surrounding mountains. After a good night on board Porsild being gently rocked to sleep by the sea we woke up to the smell of fresh coffee ready for an exciting new day in Disko Fjord. First on the agenda(after collecting our campers) was to go look for a radioactive hotspring, not to worry though, it was not radioactive enough to make us glow in the dark. Even for the crazy German Andreas who walked barefoot. This spring is homeothermic and thus never freezes. 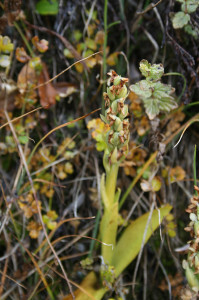 This creates a very unique environment that allows species like orchid and Angelica to grow in an otherwise harsh environment. Rumor has it that the vikings used to smoke Angelica and further the Inuits have a tradition of using it for producing an alcoholic beverage. 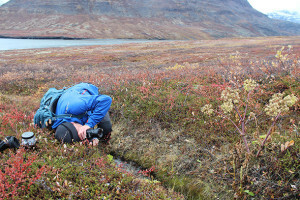 So, armed with GPS-coordinates and survival suites very suitable for boat rides in the arctic (but definitely not for long walks) we were put to shore within a short walking distance from this elusive spring. Or so we thought. Apparently our captain didn’t care much for those coordinates. This could either have been a miscommunication (none of us speak Inuit very well) or he just felt we needed some exercise (he was probably right considering the high amount of potatoes and gravy in our diet up here…), because we ended up walking up and down moss-covered hills for about one kilometer before reaching said spring. Finally there, everybody was on their hands and knees taking pictures from all kind of weird angles of Angelica, gypsum fluorite precipitation on rocks and withered orchids. 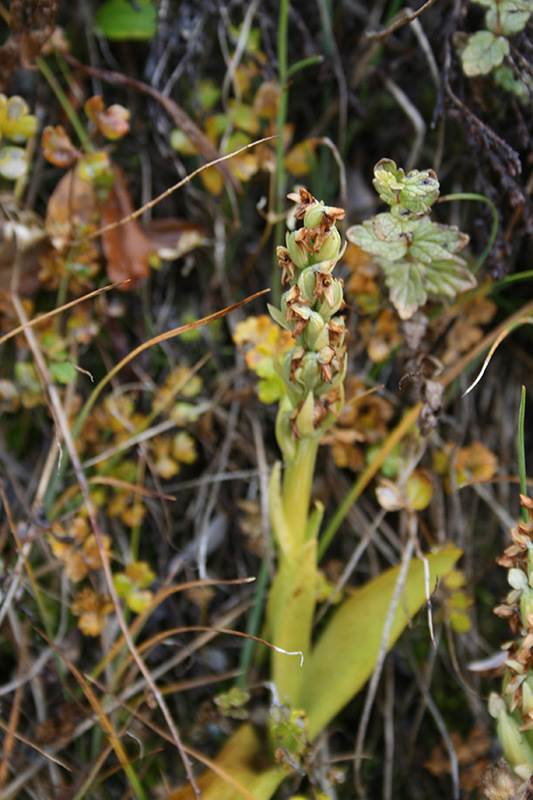 Surprisingly enough, the orchids were no longer flowering at this time a year – but what do a bunch of marine biologists know about that stuff anyway. Back on the boat we had a very quick cup of coffee and then off we went for the next agenda of the day, Lithothamnion sampling! So tune in on our blog tomorrow for more exiting scientific facts about this topic. 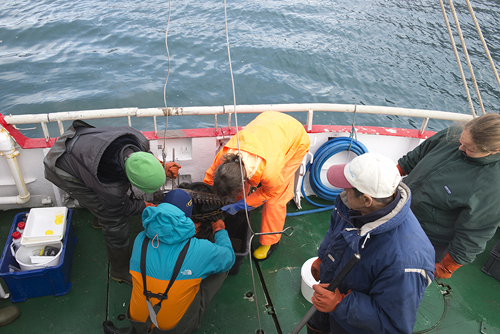 This entry was posted in ForBio, ForBio Marine Course Greenland and tagged Arctic Station, Disko, ForBio marine course, Greenland on September 22, 2013 by cto042. Saturday 14th of September, a day with a handful of events throughout history: Stephen V ends his reign as Catholic pope (891), The Netherlands and England sign a peace treaty (1662) and Walt Disney gets the Medal of Freedom at the White House (1964) to mention a few. 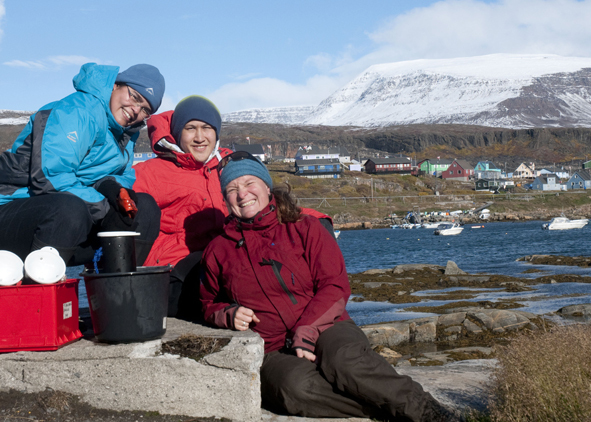 Moving towards present day and we find scientist and researcher Anne Helene setting up her traps on an experiment to catch amphipods at the local harbor in Qeqertarsuaq, Greenland. 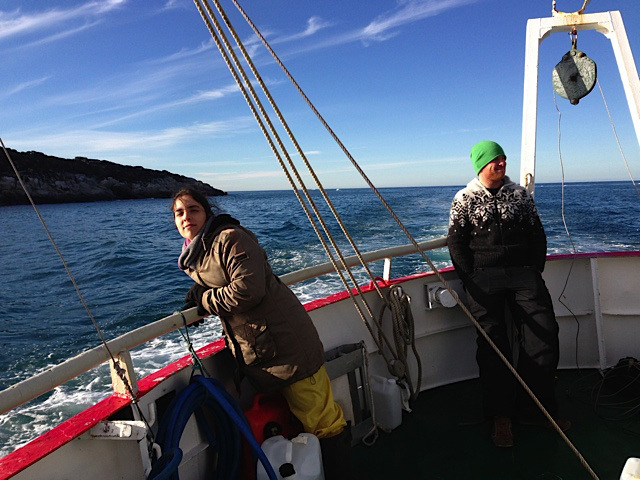 With a warming sun and clear sky in the back she is assisted by enthusiastic students Henning and Daniela heading towards the chosen localities for the traps. To understand this experiment a little better we need to go back in time to the happy 90’s. 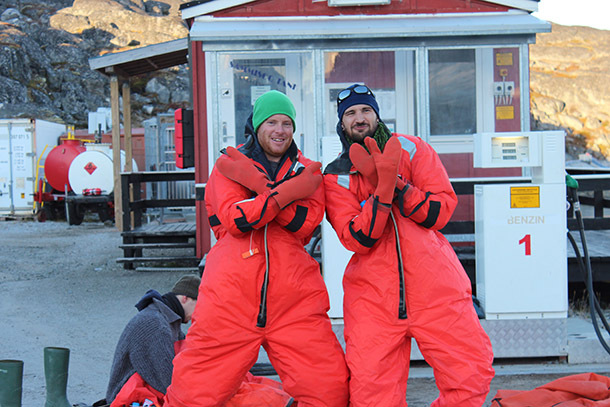 In 1990 Yves Scailteur and Claude De Broyer examined feeding in amphipods at the Arctic Station, Greenland from July 25th to August 18th. 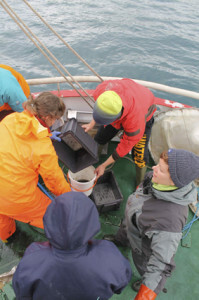 In one of the experiments traps were laid between 80 and 180m depth to catch the temperature and light sensitive amphipod Anonyx makarovi, in another experiment they examined the scavenging amphipods that were present at shallower depths. 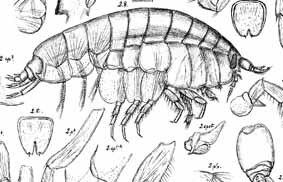 23 years later scientist Anne Helene decided to set up a similar experiment to study scavenging amphipods. She made three homemade amphipod traps consisting of plumber tubes, plankton net, horse clamps and funnels and the result looked like this. 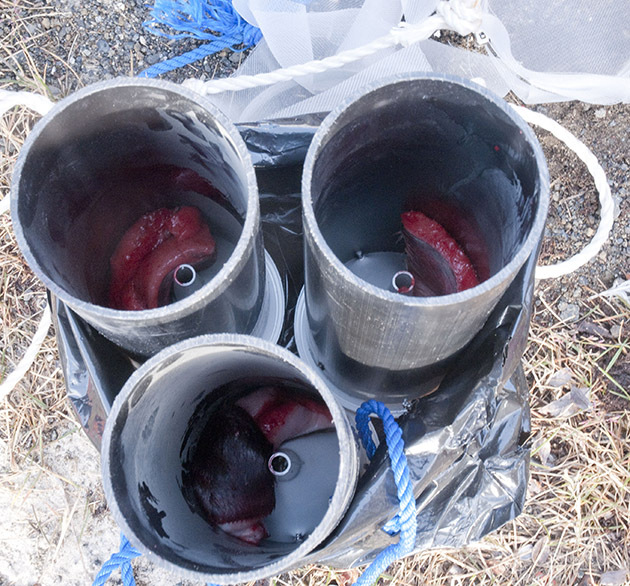 Traps “armed” with fresh seal blubber. So on a sunny Saturday afternoon Anne Helene, Daniela and Henning set out to place these infamous traps to gather some amphipods for further examination. For bait the traps were fitted with fresh seal blubber straight from the fish market and a nice good chunk was put in to keep the amphipods well fed. 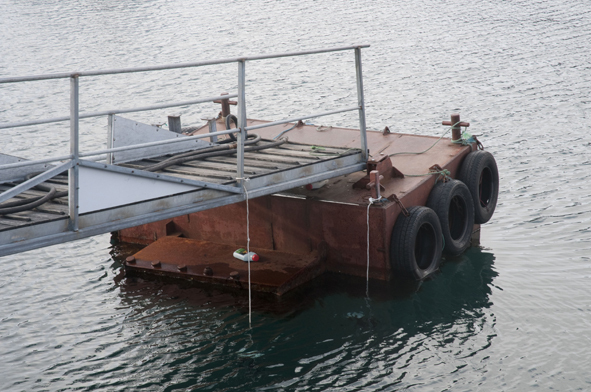 There were chosen two localities for the experiment, the royal dock (actually just a floating dock with a bridge) by the museum of Qeqertarsuaq and at the harbor next to the research vessels docking point. The traps were hung with a solid rope roughly 2m down into the water with different colors to differentiate the two locations when collected; blue rope would indicate the dock and white would be the harbor. Site 1: “The Royal Dock” Site2: The harbor. After 24 hours of exposure in the different sites, on a windy Sunday afternoon the three characters went to collect the traps, and to their relief they were still there! 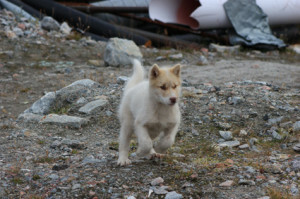 The traps were collected and on their way back to the Arctic Station they spotted a sunken ship, sledge dogs and friendly people greeting us as we passed by. So what was the outcome? Not a single amphipod…. Why? They really don’t know. It could be a number of factors from leaving them for a too short amount of time to feeding the scavenging munchkins something other than delicious seal fat. But wait! The traps weren’t completely empty! There were a couple of polychaetes (Phyllodoce maculata) gathered around in one of them that seemed to be fascinated by the blubber and the blood. 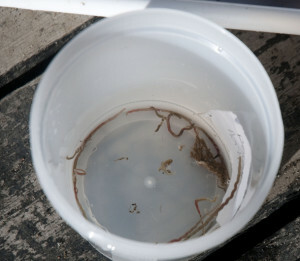 And even if the plan wasn’t to catch polychaetes, a failed attempt doesn’t have to mean that the findings don’t matter. In science we don’t discriminate! Our sampled species: Phyllodoce maculata (Linnaeus, 1767) with seal blood in the gut. 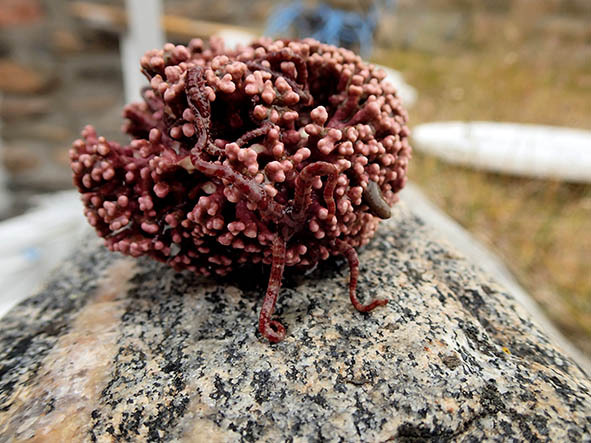 This entry was posted in ForBio, ForBio Marine Course Greenland and tagged Amphipoda, Arctic Station, Disko, ForBio marine course, Greenland on September 21, 2013 by cto042. 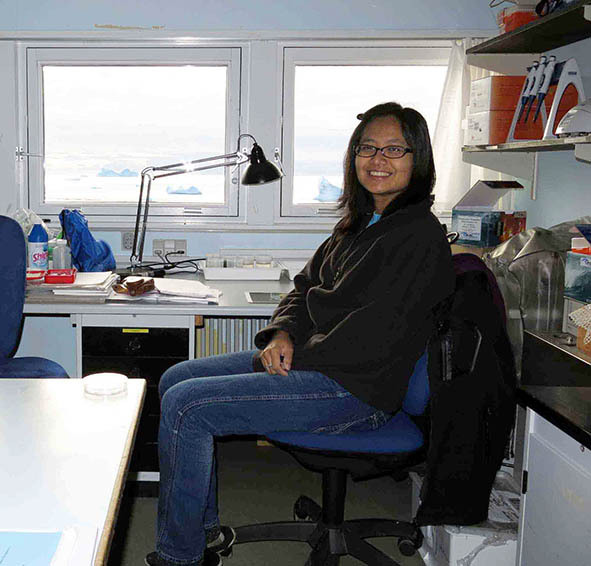 Porsild is the research vessel of Arctic Station and our workplace when we go out for collecting samples. 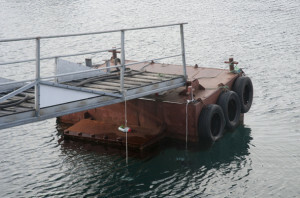 It’s a 15m long and 5m wide vessel that can transport 12 passengers and three crew members during daytrips. Eight people can stay over-night on board. Prior to sampling we plan which stations we are going to visit and which sampling gear will be needed. This has to be done with care as space on the ship is limited so we only want to take equipment that is absolutely necessary. In order to get an overview over the marine biodiversity around Disko Island, Porsild takes us to places such as Disko Fjord and deeper waters south of Qeqertarsuaq. 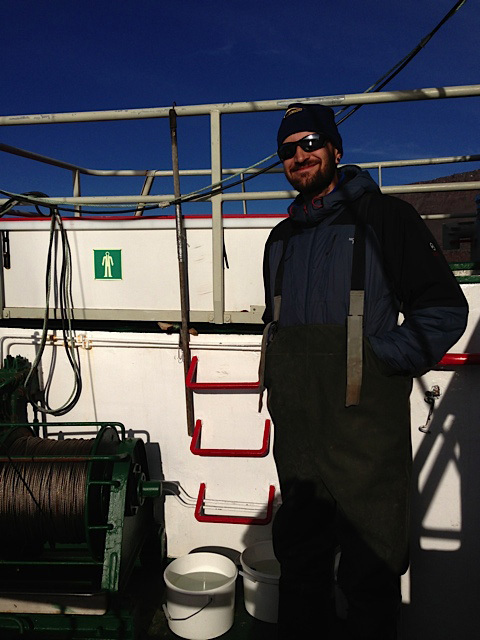 On board we use several sampling tools and two winches. The larger winch has a 400m wire and a lifting capacity of two tons. 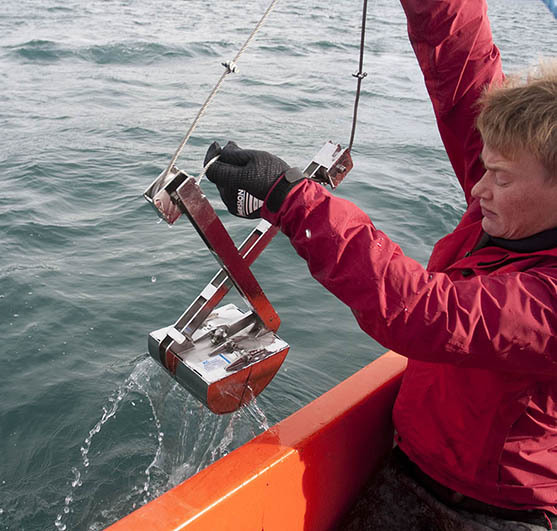 The smaller winch has a wire length of 800m and is mainly used for lighter sampling such as with the plankton net. 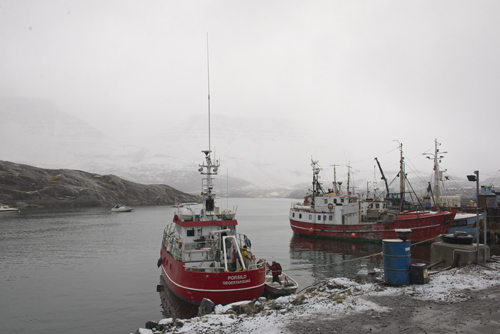 This entry was posted in ForBio, ForBio Marine Course Greenland and tagged Arctic Station, Disko, ForBio marine course, Greenland on September 20, 2013 by cto042. Woke up bright and early on day 6 of the ForBio Marine Course in Disko Island, Greenland to the beautiful sight of blue skies and the sun reflecting off the icebergs in the bay. After a delicious breakfast the group divided up to tackle multiple tasks, which included activities such as sorting samples gathered on the Porsild trip, identifying multitudes of exciting species and a trip to an intertidal area outside the village. 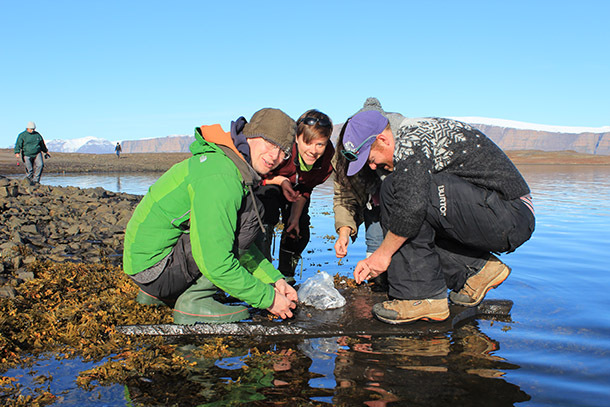 After weaving our way past bands of fearsome sledge dogs aka ‘wolves’, the band of intertidal researchers arrived in a premium location for investigating life in the rocky pools, blue mussel communities and macroalgae. To observe macroalgae communities, a brave (and slightly crazy) Danish researcher (Mette Möller Nielsen) snorkeled around the coast in water with a temperature of around 3°C with icebergs as her companions. As a safety precaution a rope was attached to her and held by a shore person, this technique was later dubbed as ‘orca fishing’ as she closely resembled a seal in her wetsuit, fortunately for her no orcas were sighted. The blue mussel expert present (Jakob Thyrring) was jubilant as the area had thousands of blue mussel specimens, which will be important for his research on understanding climatic changes in Greenland. 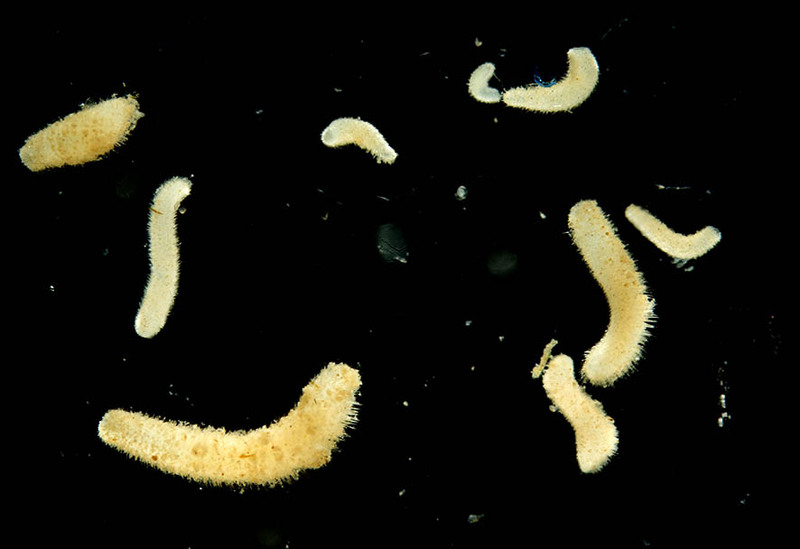 Meanwhile, another enthusiastic researcher (Peter Kohnert) had discovered a ‘gold-mine’ of nudibranchs which will probably take the better part of the rest of the decade to identify…..but he was excited nonetheless. Once sampling had finished we enjoyed a slice of frozen bread with herring and a hot steamy cup of coffee in the sunshine whilst enjoying the beautiful views. 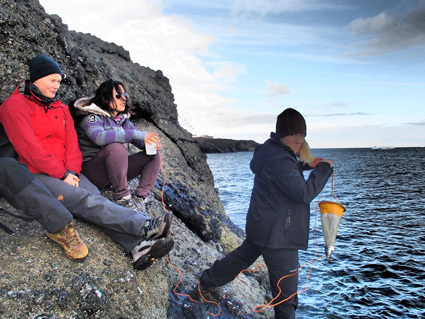 “Orca-fishing” with human bait… Sampling phytoplankton from the shore. In the afternoon more identification of amazing arctic species ensued and terms such as chaetae, papillae, dactylus, subchela and rostrum were thrown around with abandon interrupted by the occasional cheer once someone had successfully identified one of the many cryptic species. 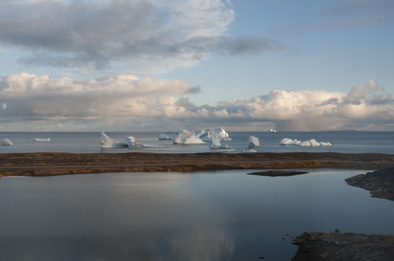 A small party attempted to catch some arctic fish species and phytoplankton at an amazing location dominated by large cliffs, icebergs, the occasional whale and beautiful tundra-like vegetation. Unfortunately the level of expertise in the fishing department was not quite up to scratch resulting in a catch of one piece of seaweed and little else, luckily we are here for at least another two weeks and can work on our techniques. 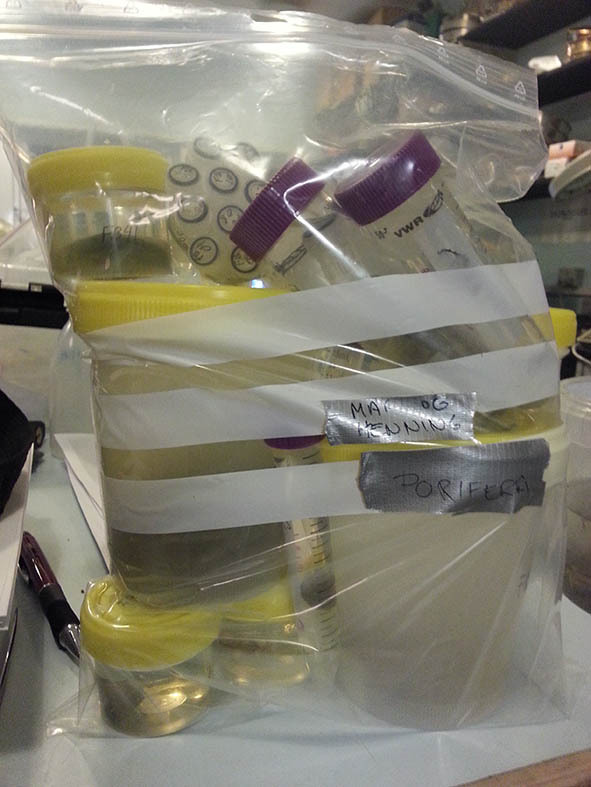 The phytoplankton scientists had more success, getting a large haul of the microscopic organisms. Satisfied with our sampling success for the day we headed back to enjoy a delicious meal of local lamb and exciting presentations given by members of the team. 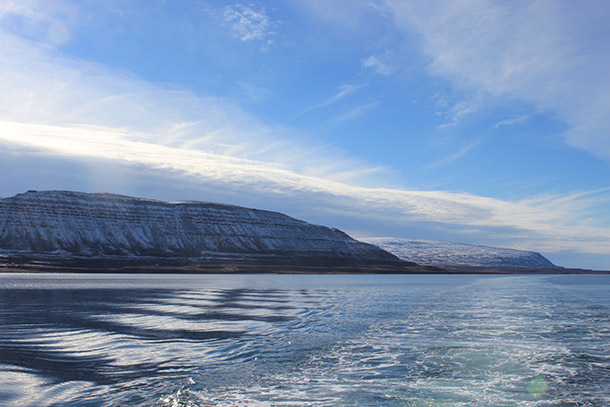 This entry was posted in ForBio, ForBio Marine Course Greenland and tagged Arctic Station, Disko, ForBio marine course, Greenland on September 19, 2013 by cto042. 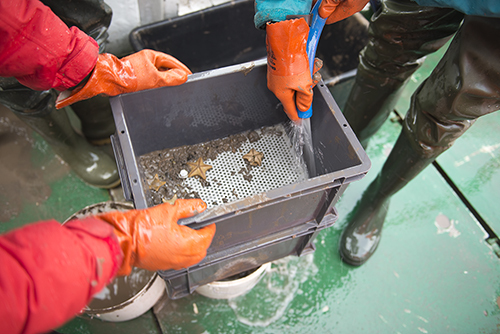 The first day of sampling did not go exactly as planned, which is more the rule than the exception when it comes to marine sampling. 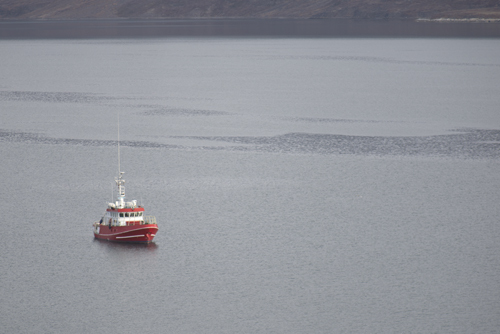 Due to bad weather and some technical issues with the boat it was not safe to go as far out to sea as we wanted to, but instead we stayed near the harbor in Qeqertarsuaq and took samples there. With the triangular dredge we got some macroalgae (kelps), including one beautiful species with circular holes in the leaves. This alga is a common species here, but it was new for most of the students attending the course. 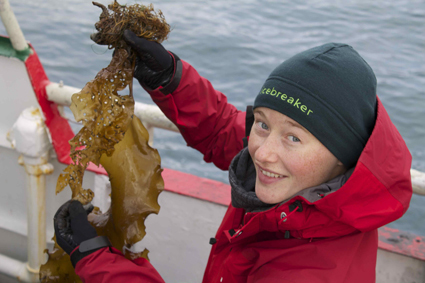 The roots of the kelp are a habitat for many small animals, which we picked out by hand when we got back to the lab. We also sampled mud with associated fauna, most of which was sieved on deck to wash out the animals. Some of the mud however was taken back to the lab undisturbed to look for meiofauna, small fragile species that would be crushed or lost in the sieving process. 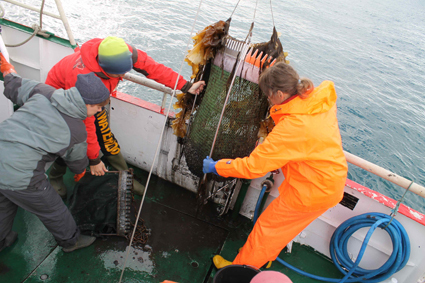 In addition to the benthic sampling we took plankton samples with a plankton-net that was dropped down to approximately 25 meters and pulled slowly back to the surface. This turned out to be not very successful probably due to high seas and small manoevering space. 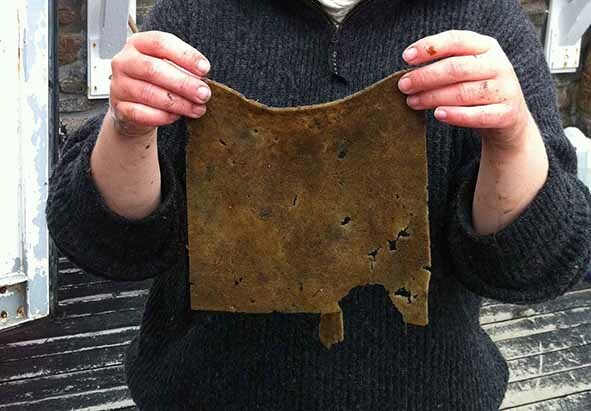 Mette shows the “holey” kelp. Seaweedy and muddy catch. The most abundant animal groups in the benthic samples this day were polychaetes (bristle worms) and amphipods (crustaceans). When we started looking at the samples under the dissection microscope the diversity of polychaete families and species were much higher than expected, and to begin with nearly every new specimen represented a new family. It was, however, very challenging to identify the polychaetes to species for many groups, because the literature and keys that are available usually only include European or Scandinavian species, but with a combination of keying and googling for local Greenlandic fauna we managed to identify a large proportion of the material. 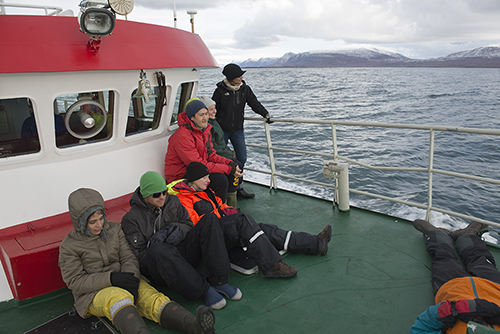 The student group is very varied, with PhD students in fields ranging from neurotoxins and fish physiology to population dynamics and meiofaunal taxonomy. Although everyone has their own little project during the course, we all chip in with the general identification work and compiling species lists of the collected material. 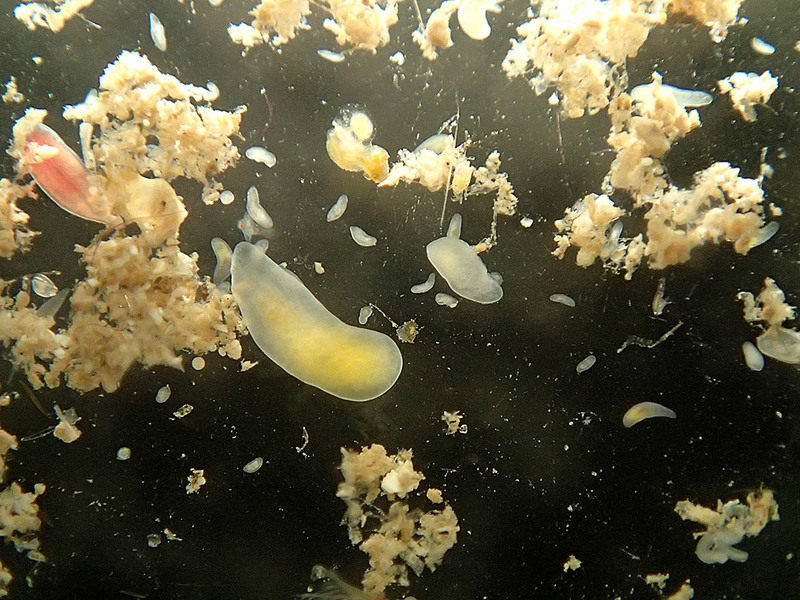 Even our fish physiologist, Jeroen, got to identify some polychaetes, and he was fascinated to see that what only looks like small, boring worms to the naked eye are in fact beautiful creatures when you get them under the microscope. Making friends – there are sledge dogs everywhere! 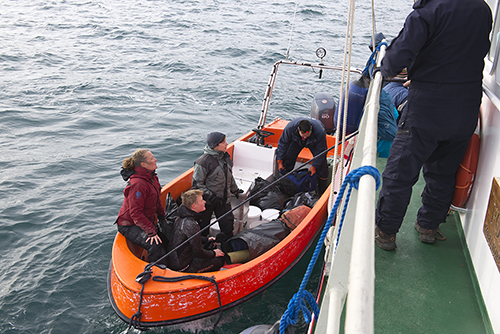 Fifteen students, two teachers and one teaching assistant on an autumn adventure to study the marine fauna and flora of the West-coast of Greenland. 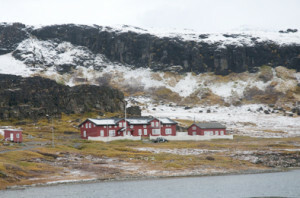 After an overnight stay in Copenhagen, we took a plane to Kangerlussuaq (Søndre Strømfjord) and then – after a pleasant walk in the sunshine exploring the surroundings of Kangerlussuaq airport – to Aasiaat (Egedesminde), South of Disko. Our planned two-days stay in Aasiaat (including whale watching trip and guided tour through the town and cultural history museum) had to be extended for one more night due to the weather conditions. Thanks to the nice people at Aasiaat Sømandshjem we didn’t have to stay out in the cold. Some of us slept in the conference room – but everybody got a bed. 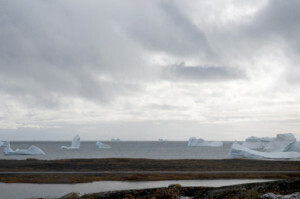 The storm, however, faded away over night and we arrived safely at Qeqertarsuaq (Godhavn), where Ole Stecher – scientific director of the Arctic Station – waited for us to give us a warm welcome. 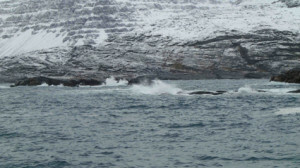 Humpback whale in Aasiaat. 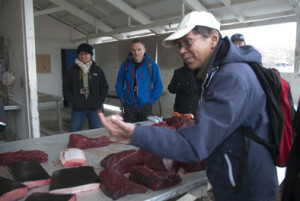 Our guide let us try fresh, raw minke whale. 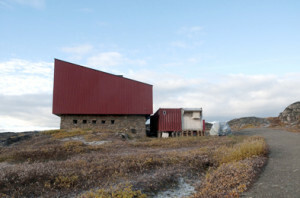 The Arctic Station just east of Qeqertarsuaq (Godhavn) was founded in 1906 and has functioned since as a base for scientific research and training, with a special focus on the Arctic environment. This was made possible by the initiative of the botanist Morten P. Porsild. Today, the Arctic Station is run by the University of Copenhagen. 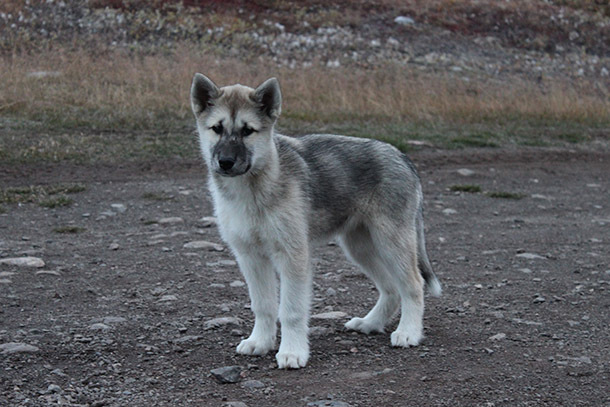 It is situated North of the polar circle in the rich nature of Disko Island. 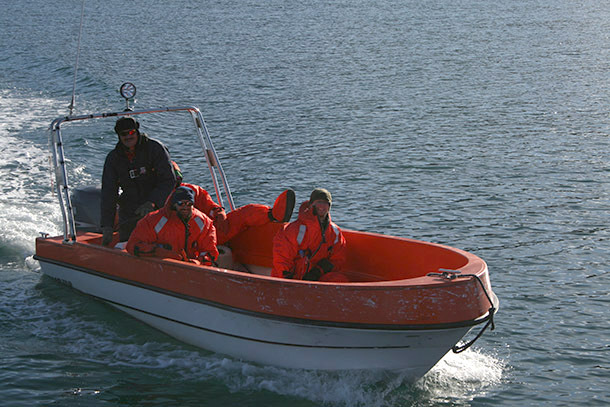 For our marine biological course, we can make use of the station’s research vessel Porsild and of a smaller motorboat to collect material to study in the laboratories of the Arctic Station. 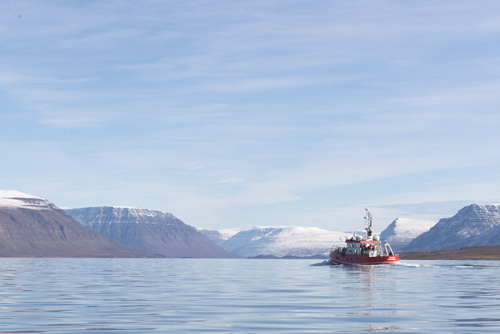 We have planned a number of collecting trips in the vicinity of the station and an overnight-trip to Disko Fjord. The station is our home for 16 days. The following entries are written by the course participants. The group contains of two students from University of Bergen (Norway), five students from Gothenburg University and two from Stockholm University (Sweden), three students from Aarhus University and one postdoc from University of Copenhagen (Denmark), one student from Ludwig Maximilian University, Munich (Germany), a teaching assistant from Institute of Marine Research Tromsø (Norway), a teacher from Aarhus University and a teacher from University Museum of Bergen (Norway). 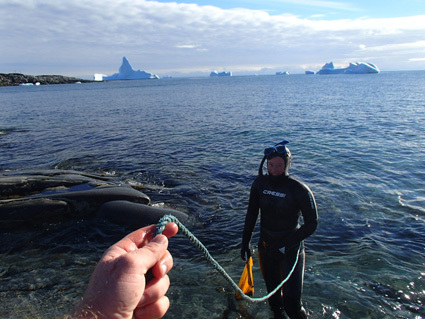 This entry was posted in ForBio, ForBio Marine Course Greenland on September 19, 2013 by cto042.